Wines will generally clear on their own. Most home winemakers will want to rack several times over the first 4 to 6 months to aid in the clarifying process of their wines. There are several methods for general clearing of wines. Just like every phase of winemaking, Vintners have their preferences on clarification procedures as well. Some would not even think of using a fining agent or filtering a wine, and others find it completely acceptable. Without going into advanced winemaking here, I will show you your options and give you insightful information for clarifying your wines. Filtering, filtering will lend a wine brilliant, and can be use without fining and/or fining. Great for pre contest!! Aging Wine Believe it or not, the most important aging of wine comes before the bottling. Bulk aging is where wine will gain so much of its character. Most wineries bulk age wine for up to 2 years prior to bottling. 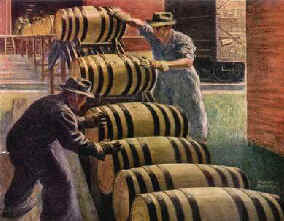 For the amateur home winemaker bulk aging is still very essential, though the length of time will not be as extensive. Bottling a wine to soon can lead to problems in the bottle, and will speed the aging process 10 fold. A GOOD wine needs both bulk aging and bottle aging. Bulk aging a wine also gives the home vintner the chance to add oaking compounds to his wines. Remember, Impatience can lead to fault!!! On the other hand, excessive bulk aging can also lead to problems such as the wine reaching its peak before its in the bottle, that would be disastrous. All wines will need to peak in flavor and aromas while in the bottle, so that they can be opened and enjoyed. There are general guidelines for the bulk aging of wines. Most aging times will be determined by the type of wine being made. There are other factors that will come into play, and as the vintner of your wines you will learn these things. As a rule of thumb, I know that if I need to do some research or figure out what's causing a problem with a batch of wine, I can always just leave the wine in bulk, under airlock and it will be fine! !